All about fitness trackers in 3,969 steps: our author treks across campus to learn more about a UMass Amherst study on the precision and accuracy of consumer activity trackers. The video of my clumsy tennis is part of a UMass Amherst study on the precision and accuracy of consumer activity trackers. Decades before millions of people bought personal activity trackers, UMass kinesiologists were working with research-grade trackers to study activity and health and investigating the trackers themselves. UMass has been on the forefront of such research, using trackers to study everything from cardiovascular rehabilitation to sitting habits. What can the global experts at UMass teach new tracker-wearers and the step-obsessed about our activity monitors? Are they accurate? Can they help us become more fit? Will taking 10,000 steps per day make you healthier? Should you walk faster? And what kind of activity trackers will we wear in the future? Starting at Munson Hall with a Garmin Forerunner on my wrist, I set off around campus to find out. Patty Freedson, longtime professor of kinesiology and activity tracker pioneer, was just weeks from retirement when I sought her out in the gleaming new Life Science Laboratories (1,054 steps from Munson and 40 steps up to Room 325.) Having worked with trackers since the mid-1990s, when pedometers were paramount, Freedson was not surprised to see consumer trackers like Fitbit take off soon after they were introduced, about seven years ago. Don’t expect your Fitbit to drive behavior change—wearing the device won’t make you walk more—look at it as a facilitator of change. Like those of us who fret about being shortchanged on our daily step counts, scientists like Freedson are concerned about the reliability of consumer activity monitors. “We need more evidence, not just that they measure what they say they are going to measure, but just as importantly, how well do they detect change?” she says. Each tracker manufacturer uses proprietary algorithms to measure activity; few independent studies have tested their claims. “Your activity tracker is only as good as its algorithms,” says Freedson. She’s excited about new algorithms being developed by interdisciplinary teams of UMass researchers in the Center for Personalized Health Monitoring, a component of the Institute for Applied Life Sciences (IALS). For example, Freedson is working with John Sirard, assistant professor of kinesiology, and John Staudenmayer, professor of math and statistics, who have a $2.2 million grant from the National Institutes of Health to develop more accurate methods to measure children and adolescents’ physical activity. Freedson leaves me with a bit of wisdom: Don’t expect your Fitbit to drive behavior change—wearing the device won’t make you walk more—look at it as a facilitator of change. In other words, use the data it collects to guide your activity and keep you interested in your own fitness. She then directs me 14 steps down the hall of the Life Science Laboratories building to learn about a current UMass study certain to draw attention from those both inside and outside kinesiology. Mendoza will outfit 32 adults with activity monitors and videotape them riding bikes, watching Netflix, baking cookies, grocery shopping, and more. After the taping, a student researcher will watch the video and laboriously chart the subject’s activity—hand counting steps and coding other movements. They will then compare the directly observed data with data from the 14 monitors. From Mendoza’s lab, I head across campus to Totman Hall (1,022 steps) to ask Katie Becofsky, an assistant professor of kinesiology who studies exercise psychology, for her take on how activity trackers influence behavior. Becofsky explains that activity monitors fit well with theories of behavior change commonly used in exercise science. They allow users to easily monitor their activity (via data such as step counts), and they provide feedback and rewards (that gratifying buzz you feel on your wrist when you reach your daily step goal). Apps in which you compete with friends also provide social support, a vital component of behavior change. Nevertheless, she says, devices like these are most valuable for the novelty factor and for making first-time users aware of their activity levels. Just as with weight loss, she says, maintenance is the challenge of an exercise program. Becofsky agrees with Freedson that unless you are already fitness-focused, an activity tracker in itself will not get you moving. Just 66 steps away, in Totman 111, Professor Catrine Tudor-Locke, chair of the kinesiology department, works at either a treadmill or stationary bike desk. Tudor-Locke wants to build on the popularity of step counting to help ordinary people optimize their fitness, with or without trackers. She has already made a major impact: it was she who did the science to demonstrate how many steps you should take per day to meet federal fitness guidelines. At 7,500 steps per day, she says, “You’re in the money.” At more than 7,500 steps, you are highly active. And if you take fewer than 5,000 steps daily, you are sedentary. Walking at a quick clip, Tudor-Locke leads me downstairs to her lab (129 steps) where we talk about her current research, funded by a $2.2 million National Institutes of Health grant and focused on a term you’ll be hearing often—cadence. Tudor-Locke’s research will establish cadence (how fast you walk, as indicated by the number of steps you take in a minute) as an important, easy-to-grasp fitness indicator. Tudor-Locke believes that public health guidelines, which advise exercising at 150 minutes of moderate intensity a week, or 75 minutes of vigorous intensity a week, or a combination of the two, are too complicated for the average person to apply to everyday life. “How can you know what is moderate and what is vigorous without measuring your heart rate or aerobic capacity?” she asks. The key to finding the proper intensity level, she says, is cadence. “We want to find out how many steps per minute you need to take to be moderately intensive.” When her research is completed, she’ll have a user-friendly table of recommended cadence ranges for people ages 6 to 85. She anticipates that fitness tracker makers will use these ranges in their next generations of devices. From Totman, I walk at a late-to-class pace, completing the 424 steps to the Sylvia O. Conte National Center for Polymer Research in three minutes, at a vigorous 141 steps per minute. I’m here to see James Watkins, professor of polymer science, who is developing nanotechnology-based health monitors that will measure far more than steps and cadence. “Wouldn’t you like your fitness tracker to be smarter?” asks Watkins. Tomorrow’s devices, he explains, will use biomarkers in minuscule amounts of your sweat or breath to measure your glucose levels, fatigue, stress, medication levels, and more. “In a perfect world, you’d put on what essentially looks like a Band-Aid, and it would feed back to you lots of information about your state of health,” he says. The challenge for scientists at the UMass Center for Personalized Health Monitoring and at the Center for Hierarchical Manufacturing, which Watkins directs, is to make these devices small, flexible, inexpensive, autonomous, and unobtrusive. “Essentially, the science we’re doing is about finding ways to make printed electronics smarter, and then we find ways to make smarter electronics that are printed cheaper,” Watkins says, distilling nanotech to its essence. I think about all I’ve learned, including the vast health benefits of a cheap, highly sensitive patch, as I walk the 1,220 steps back to Munson Hall at 100 steps per minute, the moderate pace of most students on the footpaths. 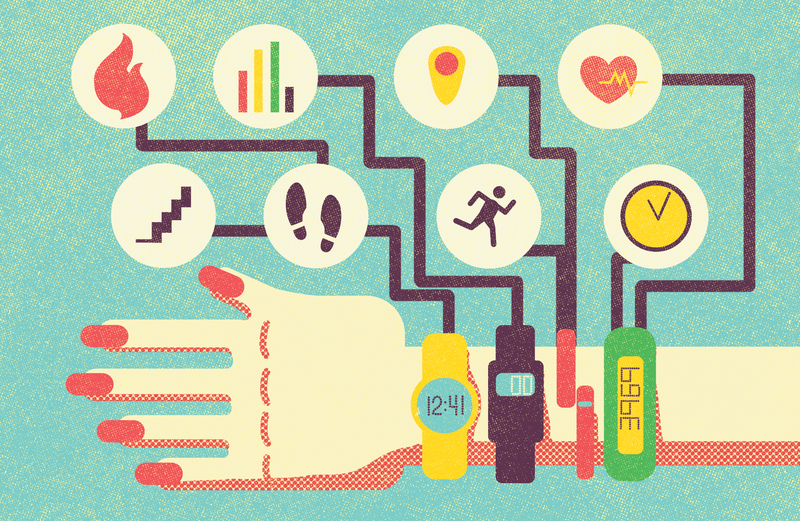 Personalized health monitoring will be invaluable to medicine. And tech geeks and exercise freaks alike will love the wearable devices of tomorrow. Thanks to UMass researchers, future fitness trackers will be more accurate and precise. I’ve also learned from UMass kinesiologists that most of us already have the tech we need to meet fitness guidelines: a watch will suffice to track cadence and minutes of activity. As for me, wearing an activity tracker revealed the sad truth that on days when I don’t deliberately exercise, I’m sedentary. Even though I’ve crisscrossed campus, my step count for research on this story totals only 3,969. I’ve confirmed a kinesiology mantra: “Being busy does not equal being active.” Luckily, it’s Monday, and as exercise scientists know, there’s no better maintainable workout than doing something you love. For me, that will be tonight’s tennis match. If I increase my intensity, I might even get to the drop shots.